Denix Historical Swords - These medieval swords, produced in Spain by Denix are highly decorative and safe. As with all Denix swords and daggers, they are made from a metal that cannot be sharpened. This Denix Excalibur Sword, modeled on the fabled sword of King Arthur, evokes scenes of the Sword in the Stone, the Lady of the Lake and Camelot. The Roman Sword, or "Gladius", evolved from weapons captured during the Romans' campaign in the Iberian peninsula. By the first century A.D., it had been refined to the form shown in this replica by Denix. The Roman Sword with Scabbard, evolved from weapons captured during the Roman campaign in the Iberian peninsula. By the first century A.D., it had been refined to the form shown in this replica by Denix. The Sword of the Crusader includes a Red Scabbard. Denix swords are Safe for display. This Sword of the Crusader includes a black Scabbard. Denix swords are Safe for display and cannot be sharpened. This Excalibur sword with scabbard, brass finish, is modeled after the fabled sword of King Arthur. It invokes scenes of the Sword in the Stone, the Lady of the Lake, and Camelot. Our Excalibur with Scabbard, Nickel Finish is the fabled sword of King Arthur. 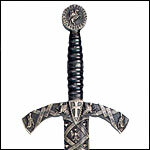 This sword evokes scenes of the Sword in the Stone, the Lady of the Lake, and Camelot.